Half the people in the United Kingdom believe water is added to grapes in order to make wine. That's one of the shockers in a bit of research detailed in an article in the Off Licence News website. The report goes on to state that two thirds of the UK don't know that Chablis is made from Chardonnay grapes and over half think the fruit used as descriptors of the flavor on wine labels is actually in the wine. The research further shows that 71% of the people polled wish they knew more about wine. At least they seem to know where they stand. Wine is not an easy subject to master - in fact, one could spend a lifetime trying and never reach that mountaintop. That's no reason not to do a little homework and make yourself more knowledgeable about wine. Just because you don't know everything, it doesn't mean you have to know nothing. It doesn't take too much effort to get an understanding of wine which will at least let you navigate the wine aisle where you shop with more confidence. Read a few wine magazines or blogs. Do an internet search when things arise that you don't understand. It's usually very simply explained. And don't hesitate to ask for help from a wine retailer, especially in a store that specializes in wine. These folks are more than happy to help answer questions you may have about wine and wine terminology. Sure, they'd like to sell you something - but they'd also like you to come back as a return customer. Sending you home with a wine you don't want does not serve their best interest. 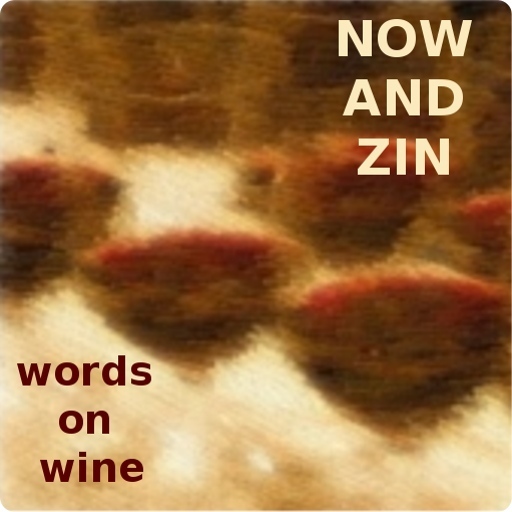 Feel free to click around right here, and on the Now And Zin website, to explore wine. You might end up able to tell your Chablis from your Chardonnay. 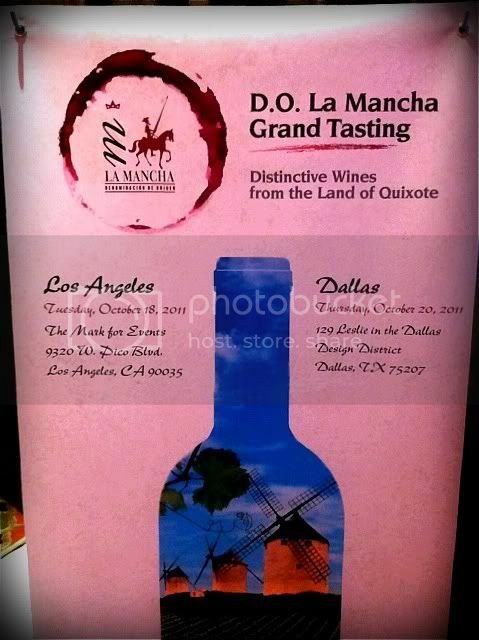 The wines of La Mancha, Spain came to Los Angeles on October 18, 2011, for a tasting event at The Mark For Events, a hall-for-hire on Pico Boulevard. One thing I liked right away about the Spanish reps who were pouring their wares: they pour like they want to get rid of the stuff. No skimpy one-ounce pours were to be found in the hall; they splashed it into the glass as if they wanted me to stay a while. I did want to stay, but the organizers said when it was over, "You don't have to go home, but you can't stay here." Well, it was a nice little afternoon vacation from the work day in L.A.
La Mancha is the largest wine region in Spain - in fact, it's the largest wine region in Europe. Their calling card is crafted from the two main indigenous grapes of La Mancha, Airen and Tempranillo. Growing conditions have proven favorable, too, for such varieties as Sauvignon Blanc, Chardonnay, Merlot and Cabernet Sauvignon. La Mancha's weather is described as "nine months of winter and three months of hell." Frosty cold winters turn into triple-digit summers and there's not a lot of rain anytime. In order to allow all the grapes to share the meager amount of water that there is, vines are separated by about eight feet in all directions. 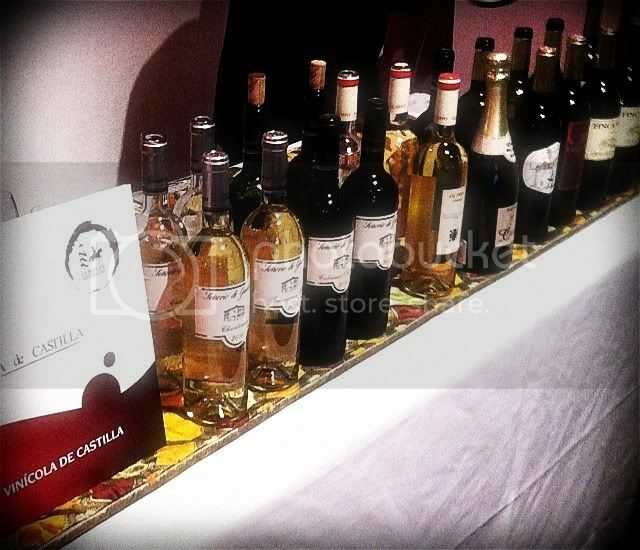 I was surprised by some of the wines at this event, namely the whites. I'm a big fan of Spanish white wines, so it was a letdown to taste so many at this event which were decidedly lacking in acidity. The reds were the big winners here, full of the dark and earthy fruit flavors I expected to find. There were some nice whites, they just weren't an across-the-board sensation. Relatively few of the wines I tasted were aged in oak barrels, and those that were often spent their time in American oak. It's always a treat to taste, for instance, a Cabernet Sauvignon which has a minimal mark of oak upon it. The fruit is really given a chance to shine on its own. What follows is a brief list of the highlights from each table I visited. The La Villa Real 2010 Tempranillo/Syrah blend has a nose as bright as sunshine and great cherry flavor in a really light and easy-drinking framework. The La Villa Real Roble 2010 is the same blend with three months of oak added. It's a little darker and more complex. Their Negora Verdejo 2010 is one of the whites I really enjoyed, with a tart grapefruit palate and good acidity. The Casa Antonete Rosado 2010 boasts a funky nose, ripe strawberry flavors and great acidity. The Casa Antonete Reserva 2004 - aged 13 months in American oak and 24 months in the bottle - is loaded with coffee notes and is silky smooth. The Casa Antonete Tinto Tempranillo 2010 is a young wine with no oak, showing an earthy nose and a vibrant acidity. The Abadia Mercier Tempranillo has cherries in abundance with a note of black tea. There's a great streak of minerality and wonderful acidity. The Allozo Tempranillo 2010 has a funky cherry nose and vibrant red fruit carried along by great acidity. Their Tomillar Sauvignon Blanc 2010 is old-world, not at all grassy. It does have a great lemon-lime palate and very nice acidity. Even better is the Tomillar Chardonnay, unoaked and showing a great citrus angle. It's one of the more refreshing Chardonnays I've had. This winery produces the Los Galanes Verdejo 2010, with a nutty nose, lemon and grapefruit on the palate and very nice acidity. The Los Galanes Tempranillo Joven 2010 is dark and earthy. There's a brilliant level of acid in this young wine. Their 2010 Tempranillo shows black cherry, great minerals and a healthy streak of acidity. oh, hell, let's not go there again. Next on the list of official holidays is Halloween, a holiday which gets a lot of attention in Tinseltown. It may well be the worst traffic day all year in Los Angeles, especially in the late afternoon and early evening when the ghosts, goblins and Lady Gagas hit the streets to grab some goodies. A recent poll shows Halloween to be America's third favorite holiday, behind Christmas and Thanksgiving. turns off the porch light and sits in the dark pretending you're not home. Anyhow, Halloween is a bad night to sit in the dark. Just ask all those people who get bumped off in John Carpenter's "Halloween." They may be trick-or-treating outside, but on the screen it's not child's play. Guru Adam Rifkin calls "Halloween" a cinematic game changer. After this one, just being scary wasn't enough anymore. If Jack-O-Lanterns didn't send a shiver up your spine before this film, they surely did afterward. The camera's focus on the Jack-O-Lantern's eye in the opening sequence sets the tone for the rest of the movie. We're given a "killer's eye view" of the goings on that occur on that fateful October 31st. The killer - social misfit Michael Myers - is evil enough for all the damned souls loosed upon the world for this one night each year. Carpenter's touch with the evil he depicts is tasteful enough - the scares don't stop, but it's not really a gorefest. That stuff really happens in the most dangerous place of all - your imagination. Hell is hosting one of those monster mashes. Halloween Wines from Kentucky - Elk Creek Vineyards makes great wine, including these scary specials. Hangman Red Wine - From Bitter Creek Winery in Jerome, Arizona, a Syrah/Petite Sirah/Zinfandel blend. Witch Creek Winery - If your broomstick can fly to San Diego, pick up some of this in Carlsbad on your way. Graveyard Vineyards - Their Tombstone Red and Tombstone White are from Paso Robles. Poizin Red Blends - It comes packed in a coffin. Twisted Oak River Of Skulls Mourvedre - Calavaras County juice that's scary good. Pumpkin Wine - Wisconsin's Three Lakes Winery sells this year-round. Scary wine labels - Preprinted for your Halloween convenience. How to make your own Halloween wine labels - Craft people just loooove them some Halloween. Jack O'Lantern Golf Resort - Oh, the screams from the first tee! A course sure to give you the yips. Don't get too far into the rough. Michael Myers may be in the foursome ahead of you. The Selbach Riesling is a quality wine from the Mosel region, with grapes taken from the vineyards on the steep banks of the Mosel River. It's described as a Kabinett wine in German wine terms, produced in dry style. The alcohol content is 11.5% abv, so it's fairly easy to drink. The wine came to the United States courtesy of Terry Theise, an importer and writer whose book, "Reading Between the Wines," has gotten a lot of fantastic press. The bottle was listed at $14 when I picked it up earlier this year at a sale price of $9. This '06 Riesling has enough age that the petrol smell for which Riesling is known is starting to come through. There's a fairly nice scent of "gasoline on the water," which will be familiar to you if you've ever gone swimming near an outboard motor. In fact, the scent is strong enough that it is clouding the fruit expression. There's an herbal flavor profile and white fruit flavors that try very hard to compete with the minerality from the slate soil. The minerality wins the battle. The acidity isn't razor sharp, but there is enough zing there to provide a nice, refreshing Riesling experience. Another movie, another wine at The Wine Bar. The bar next to the AMC theater in the Westside Pavilion in Los Angeles makes it desirable to show up a bit early for the film. In the image, that blur of light in the upper left corner is the display which shows how long until the next movies start. That's a good idea, because the wine list at The Wine Bar is not what you'd expect at a mall. This time, waiting for "Senna," the documentary about the Brazilian Formula 1 driver Ayrton Senna, I had the Row Eleven Pinot Noir, Vinas 3. I had sampled this wine at a tasting event a couple of years ago, and was impressed then. I'm still impressed. Row Eleven makes three Pinots, one from the Russian River Valley, one from Santa Maria and the Vinas 3, which is a blend from vineyards in Sonoma, Santa Barbara and Monterey Counties. The '08 Vinas 3 blends not only different vineyards, but different Pinot Noir clones - Pommard, Dijon and Martini, for the wine geeks among us. I had the '09 this time, and I am making the assumption that it is blended in the same configuration. It's $11 by the glass and turns in a 13.9% abv number, which is fairly old world for California Pinot. The nose shows cranberry and smoke, with a very lovely expression of earth. Smooth, full and rich in the mouth, flavors of red fruit are abetted by mocha and a nice minerality. The tannins are nice and round, so there are no jagged edges on the palate. It may not be indicative of any one terroir, but it's a great way to pass twenty minutes or so until the movie starts. The big daddy of the wine world is Cabernet Sauvignon. The intense - and often expensive - red wine which helped catapult California wine to worldwide prominence. If you had a dollar for every Napa Valley winery producing world-class Cab, you might be able to buy one bottle of the good stuff. 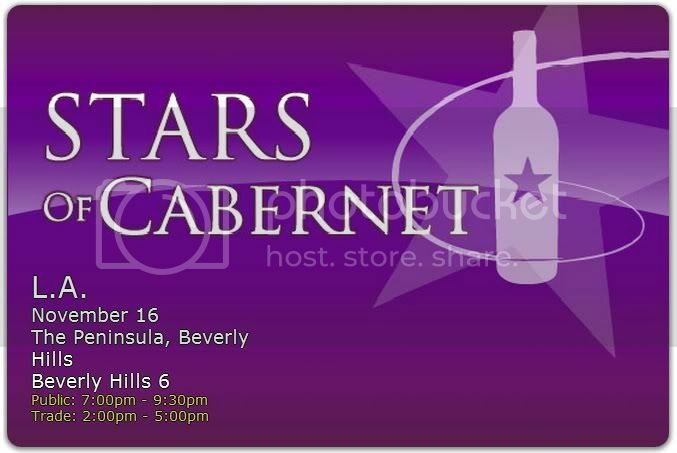 Stars Of Cabernet is a tasting event which will showcase great Cabernet Sauvigon in the elegant setting of Beverly Hills' Peninsula Hotel. The third annual event is set for Wednesday November 16, 2011 from 7:00 to 9:30 p.m. Tickets are valued at $250 per person, and advance ducats are reduced to $175, with further price reductions for members of Learn About Wine's Vintage Club. Learn About Wine was founded in 1995 by wine educator Ian Blackburn, who has made it his business to offer palate-expanding classes and wine tasting events in Southern California. His events are typically dressy affairs held in elegant surroundings and offering a huge array of top-quality wines for sampling. He puts a lot into each of his events, so it's likely you'll get a lot out of them. This year's Stars Of Cabernet will offer an expanded food selection - and it was pretty good to start with. Only 100 tickets are available, so you won't find yourself fighting a crowd at every table. Great Cab producers like Grigich Hills, Heitz, Jaffe, Kathryn Kennedy and ZD Wines - plus many others - will be there, and this year marks the first appearance for David Arthur Vineyards and Justin Vineyards. You'll find a full listing of wineries on the Learn About Wine website. Traditional wine grapes don't grow too well in the very cold climate of Vermont. The Vermont Grape and Wine Council reports only 14 wineries, some of which import juice from California. The VGWC notes, though, that great wine is being made from cold-hardy varieties like Frontenac, Riesling, Cayuga and Lacrescent. The weather that throws a curve to grape growers happens to be pretty good for beekeepers and apple farmers, though. Mead (made from honey) and cider ( from apples) are a big part of the Vermont wine scene. Ice wine is also a local favorite, as is ice cider. 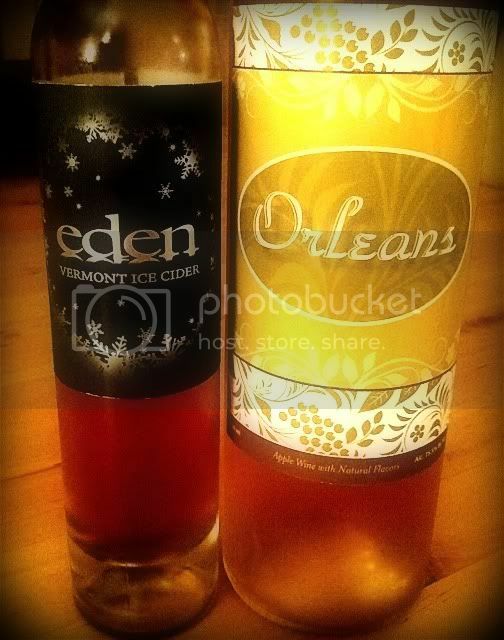 Eden Ice Cider Company operates from a former dairy farm in the Northeast Kingdom village of West Charleston, Vermont. "Northeast Kingdom" refers to a three-county area in the northeastern corner of Vermont. Vermonters refer to it simply as "The Kingdom." Eleanor and Albert Léger established Eden in 2007. Since then, they have planted over 1,000 apple trees and produced three vintages of their ice cider. The cider is produced from 100% Vermont-grown apples - some are estate fruit, some are purchased from other vermont orchards. Ice cider is not made exactly like ice wine, but the processes are similar. Ice wine is made by harvesting frozen grapes and bringing them in for fementation. For ice cider, the apples are pressed in early winter but the juice is left outdoors to freeze for four to six weeks. The frozen juice is then brought indoors, melted and fermented. This brings out the sweetest juice. The Légers are proud of their natural approach to cider making. "We don't add coloring, sugar or any other flavoring. We blend (apple) varieties to achieve complexity of flavor with sufficient natural acidity and structure to balance the residual sugar." It takes more than eight pounds of apples to make a bottle of cider. The result, according to Erin Zimmer of Serious Eats Blog, is like "drinking the juice of ten apples in one gulp." Eden Cidre de Glace du Vermont Calville Blend 2010Eleven different apple varieties go into this blend: Empire, Macintosh, Roxbury Russett, Calville Blanc, Cox's Orange Pippin, Hudson's Gem, Ashmead's Kernel, Esopus Spitzenberg, Black Oxford, Belle de Boskoop and Reinettes. Whew! This cider has a 10% abv number and 15% residual sugar. The color is a beautiful golden hue, deep and rich looking, a little darker than apple juice. The aromas the ice cider offers are of baked apples, pure and simple. It's a lovely nose. The taste is sweet and much more concentrated than apples or even apple juice. After all, you're drinking ten apples at once. The acidity level is fantastic - you'd never get this in apple juice. Sometimes I dont get it in wine! It's a slightly viscous drink with a full mouthfeel and a bit of zippiness on the finish. It's great on it's own, but is more than ready to pair with cheese or even meats. 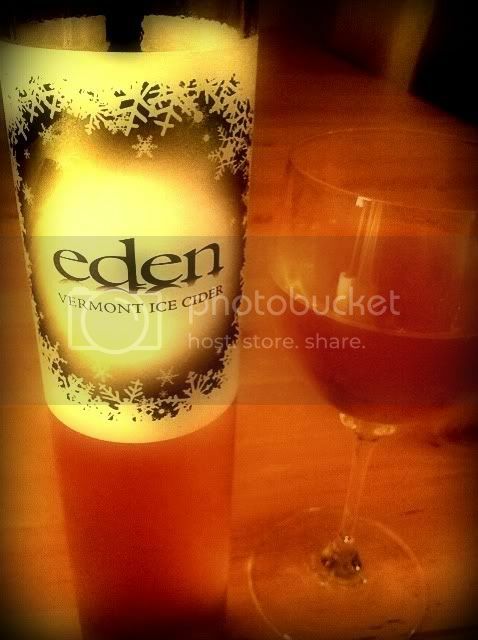 Eden Cidre de Glace du Vermont Northern Spy 2009This one is a single-variety ice cider made from 100% Northern Spy apples and aged in French oak for a year. The color is extremely rich looking, darker than the unoaked cider. It looks quite like bourbon in the glass and it smells like a holiday apple pie, with that baked apple aroma drenched in cinnamon and nutmeg. 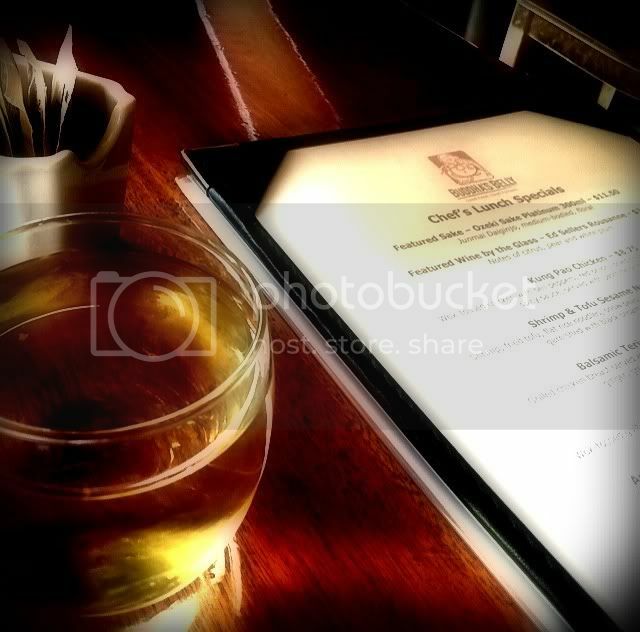 Much oak nuance graces the palate, too. It's viscous, like the unoaked, but a bit more tart on the finish. I find it quite complex with maybe a bit more of a "grownup" taste. They advise you pair it with cheddar or creamy blue cheese. Orleans is a dry wine made in collaboration with Caleb Barber and Deirdre Heekin, owners and - respectively - the head chef and maître liquoriste of Osteria Pane e Salute in Woodstock, Vermont. It is infused with Vermont-grown herbs. The alcohol content is a bit higher than the other two I tasted, 15.5%, and there is only 1% residual sugar. The comparison to Vermouth comes quickly, and Eden has a booklet of suggested mixed drinks utilizing Orleans. It's also been mentioned as a great mix with Prosecco and lime, or all by itself on the rocks. I tasted it chilled, straight up. Orleans is slightly lighter in color than the Northern Spy. The aroma profile shows herbs on apples - sage, thyme and oregano leap forward. The apple flavors have the herbs coloring the taste, too - as if Vermouth were made from apples. The finish is tart and zingy. And the herbal quality stays around long after the sip. My introduction to Vermont cider was indeed an enjoyable one. All three of these ciders would be welcome any time of the year, but the Northern Spy seems particularly suited to the holiday season. Its aromas and flavors mirror those found in holiday foods, especially desserts. The Orleans Aperitif Cider could easily be a mainstay on your bar for mixing, although it's great all by itself. Two things close to my heart will be celebrated in Paso Robles on November 12, 2011 - small wine producers and the Central Coast of California. The Garagiste Festival is all about the wines of artisan producers in the broad expanse of the Central Coast AVA. The event is to be held at Windfall Farms. Garagiste, in case you are wondering, is a French term (gar-uh-zhee-stuh) which originated in Bordeaux. It described mavericky small-lot winemakers who didn't care much for following the rules. These passionate vintners often whipped up their wine in the garage, or whatever space they had available to them. What was once just a pejorative is now a movement. Not that California winemakers operate under the burden of the sort of rules found in France, but these folks are considered renegades simply for daring to make their wine their way. Nearly four dozen wineries which produce less than 1200 cases per year will be there to pour wines that you may not get a chance to taste very often. Most of these small producers don't have tasting rooms, and their distribution is often spotty, if not non-existent. Cutting-edge winemakers like Jacob Toft, Mark Cargasacchi and Sashi Moorman will be there, and some of the Central Coast's most respected vineyards - Alta Colina, Booker, Caliza, Denner, Larner and Le Bon Climat, to name a few - will be represented. This is the inaugural event in what should quickly become one of California's favorite wine festivals. Get in the ground floor of this event and support the artisan winemakers of the Central Coast. The consumer tasting will run from 2:00 to 5:00 p.m. on Saturday, November 12th, 2011. Tickets to the consumer tasting are $55, $65 at the door if available. A VIP pass which also gets you into a couple of seminars and an after-party costs $100. A portion of the proceeds will benefit young winemakers in the Wine And Viticulture Program at Cal Poly San Luis Obispo. The western, "Johnny Guitar" is sometimes referred to as a "revisionist western" for its many departures from standard western themes. Francois Truffaut called it a "phony western," although he was one of its big admirers. Maybe "phony" means something else in French. The Arizona setting looks authentic enough, although a lot of soundstage scenes were used. Joan Crawford wouldn't allow any closeups of her to be shot for this movie unless it was in the studio, where the lighting could be better controlled. Apparently, the sunlight made her look like she'd been whipped with a wire hanger. Sterling Hayden said that during shooting he was battling Joan Crawford on the set during the day, and his second wife at night. That might explain his lack of smiles in the movie. There's no word on which battle he preferred, but at least he could leave Joan Crawford in the studio. Hayden couldn't sing or play a note of guitar - they altered that axe he lugs around so it wouldn't make any noise - but Peggy Lee does an atmospheric turn on the Johnny Guitar theme. She also shows what a singer is supposed to do during a slow, lengthy interlude with no words. "Johnny Guitar" is noted for its hidden subtext concerning the McCarthy witchhunts. Someone should have alerted Joe McCarthy to the fact that Crawford was on the set. "Hey Joe, found your witch!" 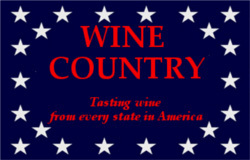 Purple Cowboy Wines makes wine from grapes grown in the revisionist cowboy town of Paso Robles, California. Their Tenacious Red, Night Rider Merlot and Trail Boss Cabernet might just be too good for the saloon, but perfect for the movie. Look for it in a revisionist cowboy wine bar - or grocery store - near you. 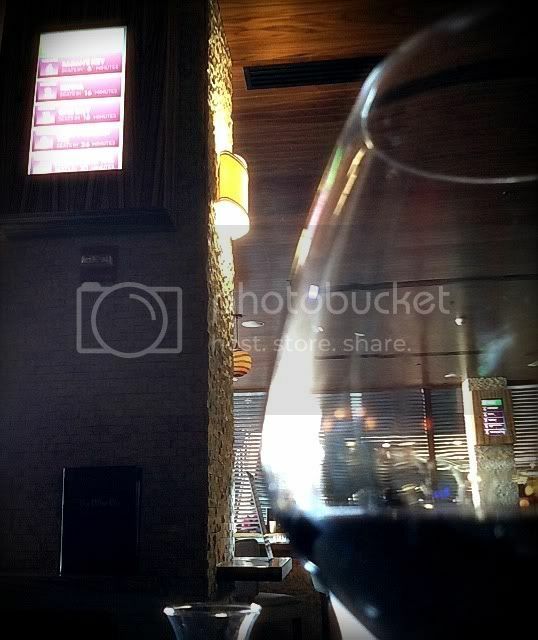 Saddleback Napa Valley Cabernet Sauvignon - For 35 silver dollars, you can tell the bartender to "leave the bottle." Saddlerock Wines - Straight outta the old west revisionist wine region of Malibu, you can saddle up for a Syrah, Zinfandel, Chardonnay or - gasp - a rosé. A Cowboy Wine Bar - Well, it's in Arizona. This may be where the Dancin' Kid is hiding out. Cowboy Horse Wine Bottle Holder - This accessory has to be a revisionist cowboy horse. The Los Angeles pan-Asian restaurant Buddha's Belly serves wine - whites, at least - in little stemless glassware which is cute and all, but the glasses are really tiny and you don't get such a great pour. Fortunately they have a decent list of reasonably priced wines. Maybe they just want you to like the wine so much you'll order another glass. I guess that's good marketing. 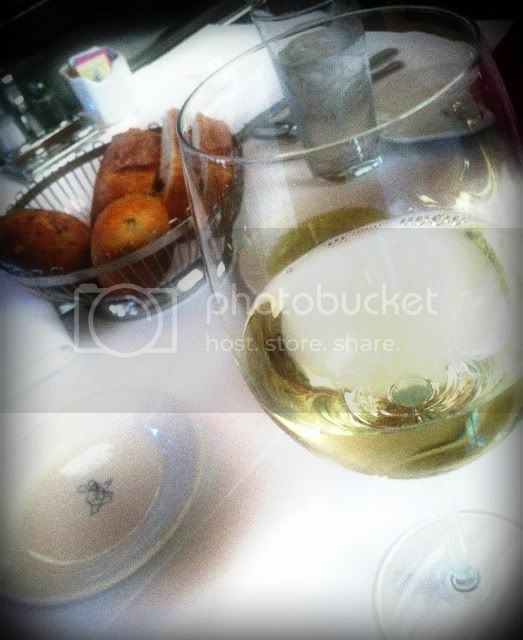 We stopped in for lunch and I ordered a tiny little serving of a very nice wine - Murphy-Goode's California Chardonnay. Eight bucks for a small glass may be a bit steep, but at least it's tasty. The Sonoma County winery states that the grapes are sourced from some of California's cool regions. The nose shows oak spice and tropical notes with a bit of pear also appearing. The taste is oaky and full, all buttery and soft with flavors of pears poached in vanilla. It's a good, old-fashioned California Chardonnay which was a hit with the chicken salad. 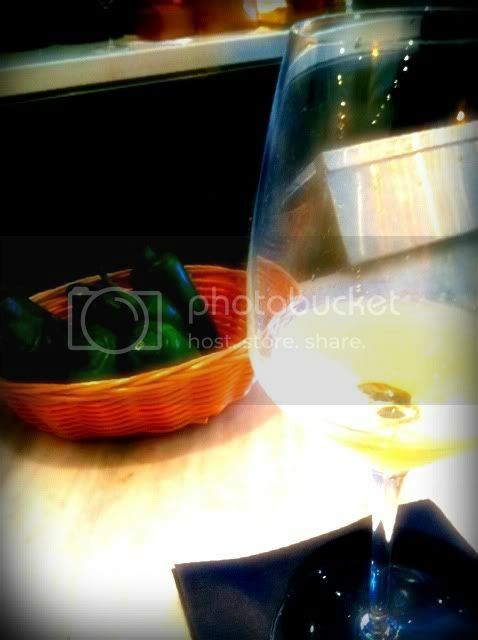 A lunchtime stop at Wood Ranch in Los Angeles seemed like a good time to try a Chilean Sauvignon Blanc. This Wood Ranch location is either in The Grove or the Farmer's Market. It's hard to tell, as it lies between the two shopping meccas at 3rd and Fairfax. It might be neither, but it's certainly not both. At any rate, the parking validation policy is no help - the restaurant doesn't kick in for the parking cost at either place, so I guess I'll stop complaining and enjoy the wine. The Casa Lapostolle Sauvignon Blanc is produced in the Rapel Valley of Chile's Central Valley region. The Lapostolle winery is owned by the Marnier Lapostolle family, the fine folks who bring you Grand Marnier liqueur. In addition to their spirits, they have been producing wine in the Loire Valley for a number of years. The family bought into this Chilean winery in 1994. The vines of the estate are apparently quite old, having been brought from France in pre-phylloxera days. The Sauvignon Blanc cost $8 by the glass. Plus parking. Grrr. A pale green tint emanates from the glass and the nose gives a gentle grassiness with minerals and wet rocks - rather like rainfall on the pavement of an expensive parking lot - joining peach and citrus aromas. The acidity is refreshing, but the wine feels full in my mouth - almost creamy, in fact. Soft lemon and lime flavors take on am essence of custard, or key lime pie. It's a great match for the fantastic clam chowder at Wood Ranch. In the United States, after Prohibition was repealed, the burden of legislating the sale of alcoholic beverages fell to the individual states. This resulted in about as many different sets of beaurocratic red tape as there were states. In today's global economy, wine drinkers have wine from all over the world available to them by way of the internet. Available, that is, if the state in which the wine lover lives permits direct shipment of alcoholic beverages to its citizens. Today, some American states still saddle their populace with antiquated laws concerning the shipment of wine and other beverages - laws that were put on the books as early as the 1930s and, in many cases, have not been changed or updated since. These legal antiquities are largely still in effect due to what's known as the Three Tier System of alcoholic beverage control. The three tiers are producers, distributors and retailers. Opponents of the three tier system note that consumers are not one of the three tiers, and therefore their needs are not met by this system. and have it shipped to them directly, the way they buy any other legal product. Activism among wine lovers has grown rapidly in an effort to get outdated legislation changed so wine lovers across the country can order and receive any wine they choose. Pay a visit to your local wine store, and you are likely to see flyers for organizations like Free The Grapes, which are urging the public to take action with messages to legislators supporting more freedom for wine buyers. The American Wine Consumer Coalition, started by wine blogger Tom Wark, seeks to give a voice to wine drinkers who are upset with the disregard their state governments exhibit toward their freedom to choose. The non-profit AWCC has a Facebook page you can "like" to show your support. A number of campaigns have also been launched over the last couple of years to combat different U.S. House bills which seek to support the Three Tier System. However you choose to get involved, it's clear that a time of action has come, and wine drinkers from all 50 states are jumping into the fray to claim the rights which should be theirs as citizens of the U.S.
Umami Burger has been all the rage among Los Angeles foodies. It's been getting so much hype generated for the chain's five locations scattered about town that every time I drove by looking to try it out for myself, there was a line out the door and down the block waiting to get in. I don't like waiting in line, especially long ones. That's why I hardly ever see a popular movie the weekend it's released. That's why I don't go to the grocery store in the early evening when everyone else is there. That's why I don't go to the DMV if I can help it. I happened by the Studio City location - they call it Umami Valli - one Saturday around lunchtime and was stunned to see nobody waiting to crowd inside. Peering in, the place didn't seem too busy at all. My Umami time had arrived. In case you don't know about umami, it has been recognized as the fifth taste our palates pick up. All these years we got along with only sweet, sour, salty and bitter. Umami is the taste described as "savory." Don't ask me why they didn't just call it "savory." I hope this doesn't mean they're going to change sweet, sour, salty and bitter to Japanese words. I have a tough enough time remembering English. I sat at the bar - red leatherette chairs - to look over the menu, and immediately felt the need for a nice, cool glass of Moscato. It's a feeling that doesn't come over me often, so I thought I'd indulge. I noticed that behind the bar there were MAS wines on tap, right from the mini tank. I asked the bartender about one selection on the list and was told "we don't carry that anymore." My Moscato request took a while to fulfill, as the bottle was empty and he couldn't locate the corkscrew. A bar without a corkscrew is in pretty sad shape. After a few minutes the only corkscrew in the place was found and the wine was poured. My bartender offered an apology and said, "somebody must have felt like they needed it." I had the Mezzacorona Moscato 2010 Vignetti delle Dolomiti. Grapes for this wine come from an area near Lake Garda in Northern Italy. Pale in the glass, the nose is fruity with pears in the forefront. The wine is off-dry and minerals and white peaches grace the palate. I "went the other way" with my pairing, and had the Port and Stilton burger. To my surprise, going the other way wasn't a bad idea. The earthy cheese and Port-carmalized onions went together extremely well, and the wine added a touch of sweetness which really set off the umami. Oh, so THAT'S what umami is! And THAT'S why the line is always out the front door! This Umami Burger location is loud and a bit warm. The burger preparation goes on right in front of you and the kitchen heats up more than the meat. The burger was $10 and the glass of Moscato cost $6. Is Gene Tierney obsessive, or does she just "love too much?" Trailers From Hell guru Neil Labute poses that question about Gene Tierney's character in "Leave Her To Heaven." If you Google (or Yahoo, or Bing) "Too Much Love," you find references to dance parties, song lyrics and advice from eHarmony. The dance party seems safe enough, but I suppose that depends on where the dance is held and whether or not someone is shooting at your feet, ordering you to dance, a la Yosemite Sam. Smothering someone with love, according to eHarmony, is the selfish, oppressive, demanding act of an insecure individual. Loving is a "give" act. Smothering is all "take." from him. She takes his unborn child from him. She ultimately takes his freedom from him. The film shows us the bright colors of a love story, and then darkens it into film noir. does end up with the girl - just not the one he came in with. In this case, that is for the best. Ironstone Vineyards' Obsession fits nicely here. Made from Symphony grapes grown in Lodi and the Sierra Foothills AVA, it's a sweetly floral quaff best served cold. As it warms up, it tends to turn a little spicy and tart. It's seductive and cheap. You'll love it. Just don't love it too much. Cold Heaven Cellars - Morgan Clendenon makes three complex Santa Barbara County Viogniers, from Santa Maria, the Sta. Rita Hills and the Santa Ynez Valley. 7 Heavenly Chards - A California Chardonnay with redemption in mind. Two Angels Petite Sirah - Bob Pepi's High Valley PS is described as "dark as the night" - might be perfect for the noir of this film. Earlier this year I paid a visit to Ancient Peaks Winery in Santa Margarita, California and was given the tour of their property. The Margarita Vineyard, looked over by the ancient mountain peaks of the Santa Lucia range from which the winery takes its name, is of particular note. This sustainably-farmed vineyard has been geologically blessed with five distinct soil types: ancient sea bed, sedimentary, shale, volcanic and granitic. This array of soil composition is credited for giving the grapes within their complex aromas and flavors once they have been vinified. Ancient Peaks winemaker Michael Sinor says their mission is to let "the soil speak through the grapes, and eventually into thewine." 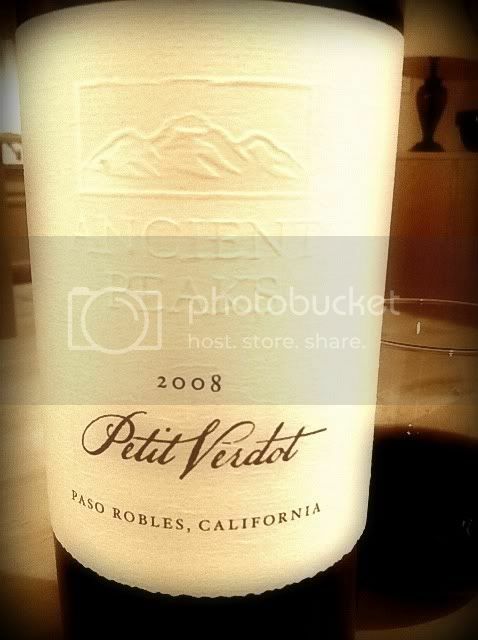 The '08 Ancient Peaks Petit Verdot is a 100% varietal wine with some heft. It tips the scales at 15.2% abv, a number which is not all that high for the Paso Robles AVA. The grapes are taken largely from the cool Margarita Vineyard with a bit from the warmer Wittstrom Vineyard northwest of Paso Robles. The wine retails for $35. On the nose, aromas of cassis show prominently, with the minerality for which the vineyard is known. Some of that 15.2% shows up at first, too. The mouthfeel is quite full, with very firm tannins, very dark fruit and strong minerality. It's delightful to find that, after all that brawn, there’s a light sense of violets on the finish. Once the bottle has been open for a while, the wine opens up beautifully and takes on a tarry note along with the intense dark fruit and earth. The tannins remain firm, though. Richard Maier always shows up at the big tent sale at Wally’s in Los Angeles to personally sell his wine. He’s there by the stack of cases - pouring, talking, autographing bottles, talking, pouring some more - all in an effort to let another city full of wine buyers know not only how good his wine is, but what a great deal it is. 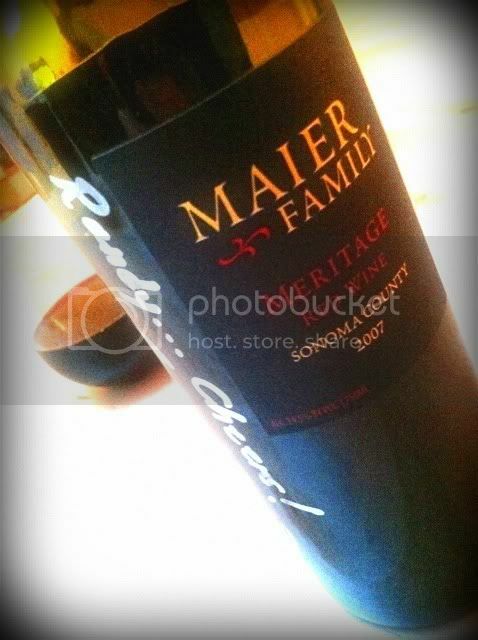 The Maier Family Meritage produced at St Helena Road Winery is a Bordeaux blend of 94% Cabernet Sauvignon, 10% Merlot, 5% Malbec and 1% Petit Verdot, “grown high in the Sonoma County mountains,” according to the back label. This single vineyard beauty was produced in a quantity of only 43 barrels, and is aged for 20 months in that French oak. Its retail price was $34 earlier this year, and I bought it at Wally’s tent sale for the screaming deal of $23. After unscrewing the cap and pouring a glassful, the juicy aromas immediately come forward. Currant, blackberry, a beautiful herbal underlay all jump right into the nostrils and start shifting the olfactory gears. The aromas are mesmerizing. The very dark fruit blends seamlessly with that herbal element. Big tannins and graphite are set off by a strong minerality. There’s a greenness on the palate,too, which matches that on the nose. The wine is probably a bit young yet. The tannins are quite forceful, and don’t really settle down as a couple of hours pass. Perhaps due to the tightly sealed screw cap, the second night showed much the same aggressiveness. On the third night I enjoyed this Meritage, I got sneaky and unscrewed the cap the night before. Now, a note of tar appears on the nose and the tannins are more manageable, but still quite firm. The green, herbal quality on the palate now takes a back seat to the driving force of the big, juicy, dark fruit. On the finish, notes of chocolate remain. Do yourself a favor and decant this wine for quite a while before drinking it. You’ll be glad you did. Baby boomer rock'n'rollers are exploring wine as an additional revenue stream these days. The California Bordeaux blend Doobie Red is spearheaded by the Doobie Brothers longtime manager B.R. Cohn, while Whitesnake Zin brings the '80s hair band back intothe spotlight. Tool and Perfect Circle frontman Maynard James Keenan makes Arizona wine under his Caduceus label and DaveMatthews has his Blenheim Vineyards right outside his Virginia recording studio. Sting produces Chianti at his Tuscan estate. Now, Rock and Roll Hall of Fame inductees AC/DC have joined forces with Australian winery Warburn Estate for a national release of AC/DC The Wine. This rockin' vino is sourced from Australian wine regions in the Barossa and Coonawarra. The line will include Back in Black Shiraz, Highway to Hell Cabernet Sauvignon and You Shook Me All Night Long Moscato. What, no Whole Lotta Rosé? 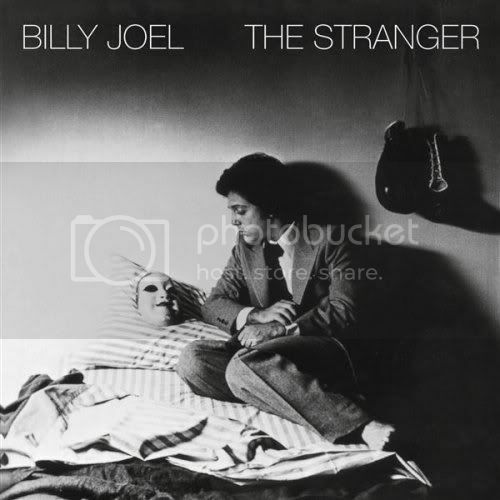 I've been a big fan of the Billy Joel song, "Scenes From An Italian Restaurant," since it appeared in 1977. There may not be an award given for "pop song that best presents wine as a social vehicle," but if there were, this song would probably win it. I've done a bit of study on songs about wine and have found that they tend to stray into the unsavory areas of drunks, bums and hobos. In "Scenes," there's no "drowning your sorrows" or "trying to forget" or "let's bum some change and get loaded." It's all about sharing wine with a friend and enjoying the memories which are revisited over a bottle of wine and a red and white checkered tablecloth. "A bottle of white, a bottle of red, perhaps a bottle of rosé instead." I understand that a waiter actually delivered that line to Joel. The singer reiterates it in the languid introduction to his tune. He sings about the social aspect of wine - citing it as an ingredient which augments the great feeling of spending time with friends and having good conversation. Back in the college days, the wine may have been cheap - it may have been bad - but it was definitely an important part of the social scene. Sure, we drank too much of it - that's what college kids do. At least, that's what non-valedictorian college kids do. We all may not have been "wine lovers" in our youth - I seem to remember a beer now and then - but we definitely loved sharing wine with our friends. Through the years, we have attended weddings - even been a part of the spectacle - and we've toasted friends and relatives on their nuptials again and again with champagne or some other sparkling wine which seemed to be the best in the world, given the circumstances. 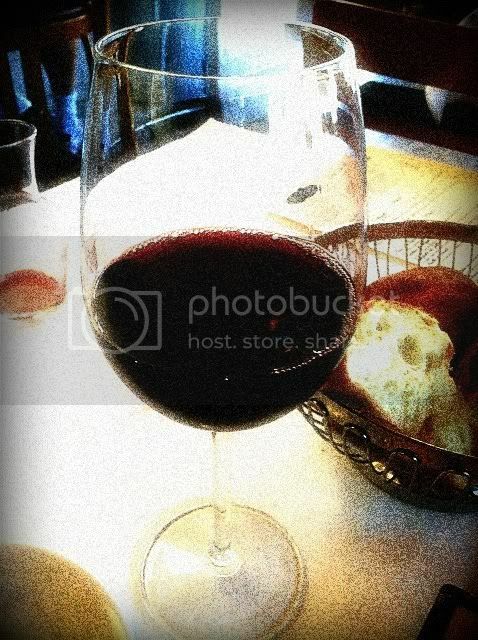 "A bottle of red, a bottle of white, it all depends upon your appetite." friends you remember the most, then the wine. I don't usually reminisce over a ham sandwich I had twenty years ago. 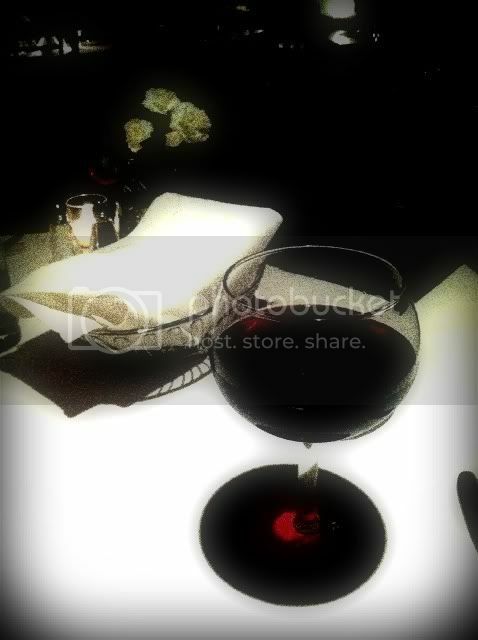 The person with whom I dined and the wine we drank are memories which do stay with me. Jerry Jeff Walker sang ever so (hic!) eloquently about sangria wine, in which he also extolled the virtues of wine plus friends. However, his Texas friends were spiking the wine with Everclear. No food needed there, or even advisable. I once brought a Spanish Garnacha to a friend's dinner party. One of the guests - a guy I didn't even know to be a wine lover - told me he liked the way the wine made the food taste - so much so, that it made his visit even more enjoyable. I don't know how I could have felt any better about that wine. "A bottle of red, a bottle of white, whatever kind of mood you're in tonight." but it was good and it was cold and the bottle was sweating even more than the cabbie who brought us to the restaurant. Another friend had a sister who loved a particular brand of cheap, California Chardonnay - a grocery store brand. Anytime the three of us got together, it was that brand or nothing. Even when I offered to spring for something else, something better, she wouldn't hear of it. The wine wasn't very good at all, but it didn't seem to matter. We had a good time sharing it every time. My wife and I have explored the various wine regions of California together many times. It never fails to warm my heart when she tastes a wine she really likes. Her eyes light up and she spills forth with tasting notes that come to her immediately, not over long swirls, sniffs and sips as with me. She has found dessert wines and Italian varieties to be her favorites, and it's always a special occasion when we enjoy those together. "I realized that it really didn’t matter what we were drinking, because the wine did its job, it created a moment in my life that I will never forget, a snapshot in time that I will remember forever, and that is what it is worth all the money in the world to me." "I'll meet you anytime you want, at our Italian restaurant." The hard thing about pairing a wine to go with a Marx Brothers movie: you have to consider not only how well it goes down, but how well it comes up. You're going to laugh while drinking it, there's no doubt. Groucho might say, "The wine has a great nose. How it got into my nose I'll never know." The Marx Brothers are one of America's great gifts to comedy. They're funny even if you don't believe in the sanity clause. To this day, in hotels I'm tempted to pick up the house phone and say "Room service, send up a larger room." I usually make do with a dozen hard-boiled eggs and "some coffee to sober up the stewed prunes." "A Night at the Opera" has laughs and music, too. High class music, even though it's sometimes hard to tell if that last note was "high C or vitamin D." There's so much opera in this film you'd think they were all "vaccinated with a phonograph needle." The Drinking Song from La Traviata will help set the tone here: "Let's drink to the ecstatic feeling that love arouses... and the love among the chalices will make the kisses hotter." The sentiment is fine, but if you can morph it into "Take Me Out To The Ball Game", then you have comedy. Groucho once said, "Wine, women and song. When you get too old for all three, forget the singing and drinking." Let's never get that old. The world needs more singing; more ecstatic feelings that love arouses; more people watching the Marx Brothers until the wine comes through their noses. "Now we're getting somewheres." Opera is the plural of opus, so why not pull out the stops and cough up a couple of Benjamins for a wine from Opus One Winery. An expensive Napa Valley Cabernet with the Marx Brothers? I found various vintages selling for $230 online. As Groucho said while throwing down the bill in front of his table mate, "This is an outrage. If I were you, I wouldn't pay it." Groucho also said, "Money cannot buy happiness and happiness cannot buy money. That might be a wisecrack, but I doubt it." Duxoup Wine Works - I know it's a different movie, but it's a lot cheaper than the Opus. At $20 a bottle, it's one of those clubs that would have me as a member. Weingut Erben von Beulwitz 2002 Spaetburgunder - I don't suppose I could pass off Karl as a Marx Brother, eh? Here's the wine list for The Groucho Club in London. If you're ever in Anchorage, I would say the Marx Brothers Cafe is a must see. Clever designers have come up with a neat way to store your wine while saving space when you're down to just a couple of bottles. In the Now And Zin household, we don't let our supply drop to such dangerously low levels, but if you only store from one or two bottles to eight at a time, you may want to check out the Mirage wine rack. 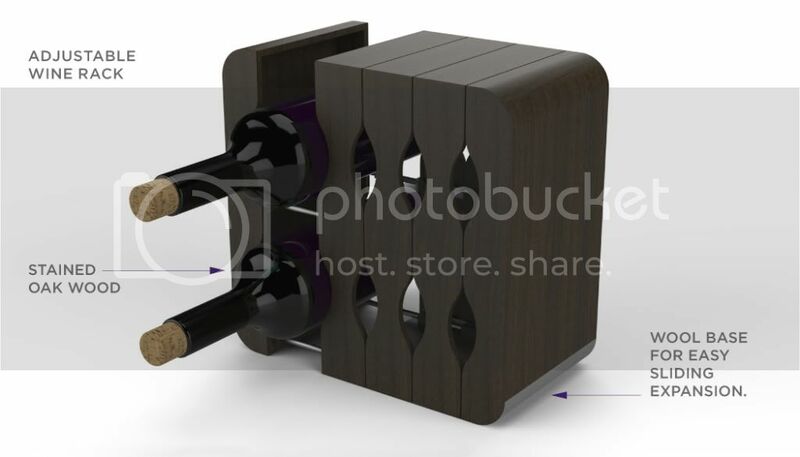 The Mirage Augmentable wine rack is a collapsible wooden rack which expands to accommodate the number of bottles. As you remove the bottles, it gets smaller, saving countertop space. Fully expanded, its two bottles by four configuration is about 15 inches wide, and only nine inches tall. The price listed is about $45, much cheaper than a full-size wine rack but more expensive than other 8-bottle storage options. Online, I found several nice looking wooden racks designed to hold eight wine bottles in a diamond configuration for about half the price of the Mirage. Here's another lunchtime stop at Terroni, a nice place in Los Angeles that favors Italian food and wine. The vibe doesn't really sing opera, but the food is good and the wine list is heavy on Italian wines. A Dolcetto jumped out at me, the '09 Luigi Einaudi Dolcetto di Dogliani. Dolcetto di Dogliani is the Dolcetto grape grown in the little hamlet of Dogliani, in Piemonte. The wine cost $10 by the glass at the restaurant. The wine is colored medium dark ruby red and features a tarry scent on the nose. Cassis, black cherry and licorice aromas also come through. The taste is dark and earthy, and the wine feels young and brash on the palate. Dolcetto - despite meaning "little sweet one" in Italian - is a fairly tanninc grape, and this one shows it in spades. It paired reasonably well with the pork loin and potato dish, but with all that tannic structure, it should have been a steak. The wine industry in New York dates back to the 17th century, when Dutch immigrants planted grapes in the Hudson Valley. Commercial production didn't begin until the 19th century. The Hudson Valley's Brotherhood Winery is the oldest continuously operating winery in America. They've been producing wine for some 350 years. 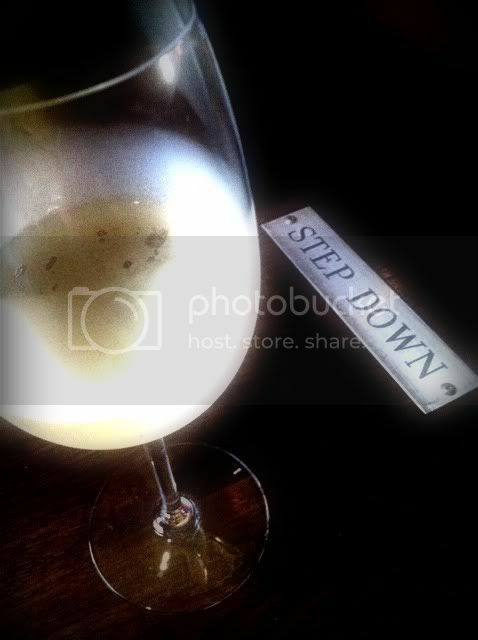 The real takeoff point for wine in New York came in 1951, when Ukranian viticulturist Dr. Konstantin Frank started telling anyone who would listen that New York's wine had yet to achieve greatness because they should be growing vinifera grapes, the kind grown in Europe, instead of French and American hybrids. His argument finally found a receptive ear in Frenchman Charles Fournier, the chief at Gold Seal Vineyards. Fournier hired Dr. Frank, Riesling was planted, and the rest is New York State wine history. 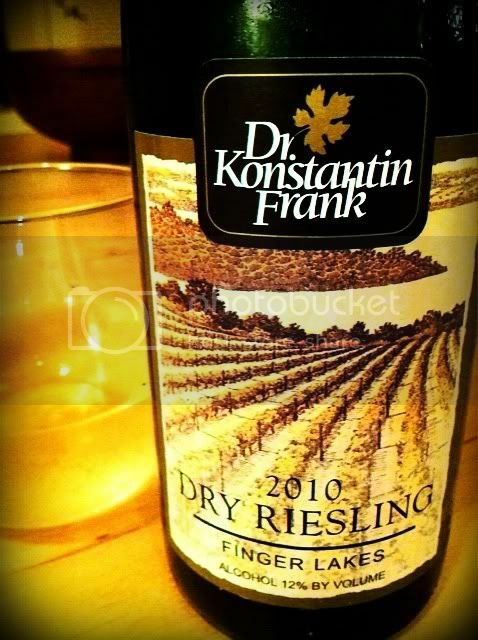 Dr. Frank has also had success with Chardonnay, Pinot Noir, Gewurztraminer and even Cabernet Sauvignon, but Riesling is his calling card. 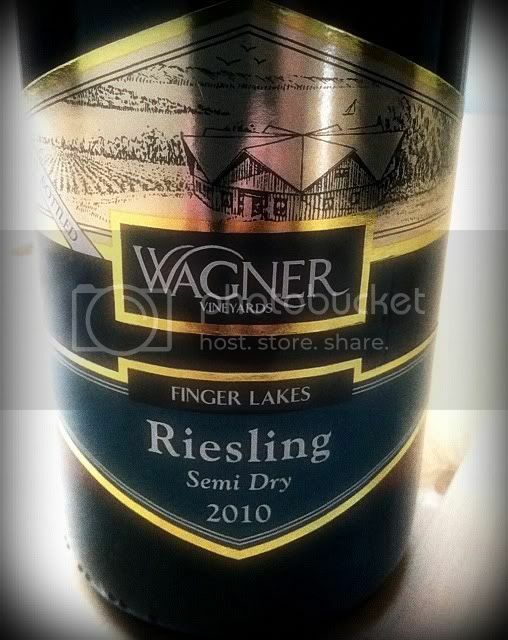 Today, Riesling is the big grape for New York's Finger Lakes region. It grows well in the cool climate. You'll also find Seyval Blanc growing in New York vineyards, along with American Hybrids like Catawba, Delaware, Niagara, Elvira, Ives and Isabella grapes. French hybrids like Vidal, Cayuga and Vignoles also get some important acreage. The Finger Lakes region is the best-known of New York's four AVAs, leading the way for the Hudson Valley, Lake Erie and Long Island AVAs. It's also one of the largest AVAs in the country and one of the leading cool-climate regions, too. The terrain around the three main lakes helps keep the vines safe through cold winters. The 2010 vintage is the product of the warmest growing season seen in the Finger Lakes region in 40 years. It was wet, too, with the most rain since 1973. Varied wines were produced, but there is a general tendency to lower acidity and big, expressive fruit. Different wineries harvested at different times, resulting in plenty of variation in styles. Most of the Rieslings produced here retail for under $20. 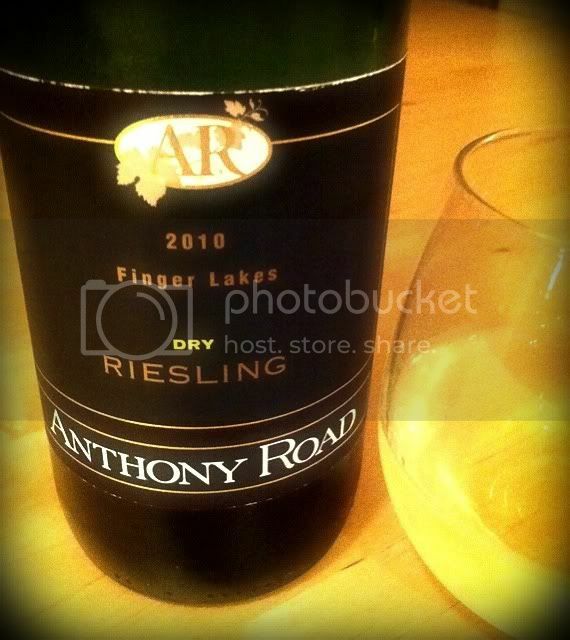 Dry Riesling Finger Lakes 2010As with all these wines, Anthony Road's is 100% Riesling with a moderate alcohol level of 12.6% abv. The fruit is from their Nutt Road Vineyard, block 3. The grapes are taken from different blocks in each vintage. There’s a “dryness meter” on the label, and the pointer points to “dry." The nose and palate have a robust minerality, something that seems to be a hallmark of Finger Lakes Riesling, at least as far as I found from these six examples. Fruit aromas here fight to get through, and a scent of melon peeks out from behind the rocks. The palate is also laden with wet rocks and a nice lemon zest flavor appears alongside very good acidity. 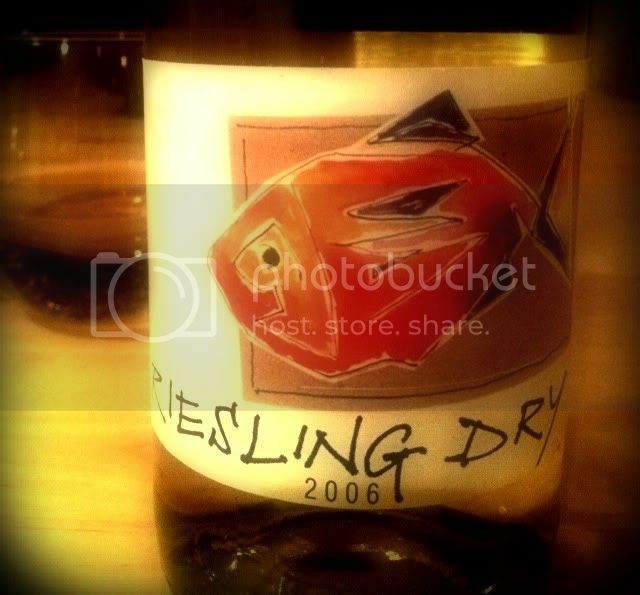 Dry Riesling 2010Dr. Frank got the Riesling ball rolling in the 1950s and his son Willy carries on the winemaking tradition. Again 100% Riesling, this wine has a 12.2% abv alcohol number. The wine is quite pale in color and has a stong minerality, but that is abetted by a huge fruit expression. The nose shows what the winery calls "Keuka Lake minerality" and an intense pear and pineapple juice profile. The palate is dominated by that slate minerality. Some citrus component accompanies it, with orange or tangerine on the finish. It's quite refreshing with an acidity which, while adequate, does not make itself the focal point. 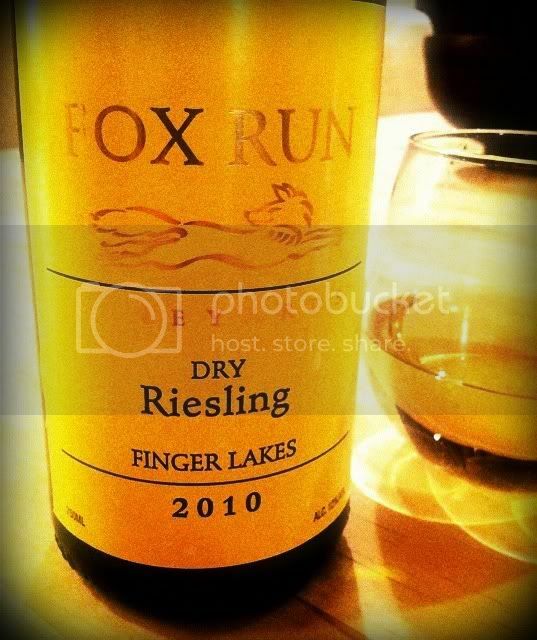 Dry Riesling 2010Fox Run's grapes are grown in the glacial Seneca Lake soil with broken slate and sandy loam. Another 100% Riesling, winemaker Peter Bell utilizes fruit from Fox Run Vineyard Block 1. The alcohol level is a low 11.5% abv. It's a lovely, pale, golden color in the glass and shows those slate minerals on the nose, along with citrus and an ever-so-slight hint of honey. The taste is full of Meyer lemon and big minerals, and there is an extremely nice acidity. The Riesling for Ravines dry effort is taken from three different vineyards: 16 Falls (70%), Argetsinger (25%) and Hobbit Hollow (5%). 16 Falls and Hobbit Hollow feature shale limestone soil, while Argetsinger is gravel on limestone bedrock. These grapes from the east side of Keuka Lake are whole cluster pressed, and the finished product shows an alcohol level of 12.5% abv. 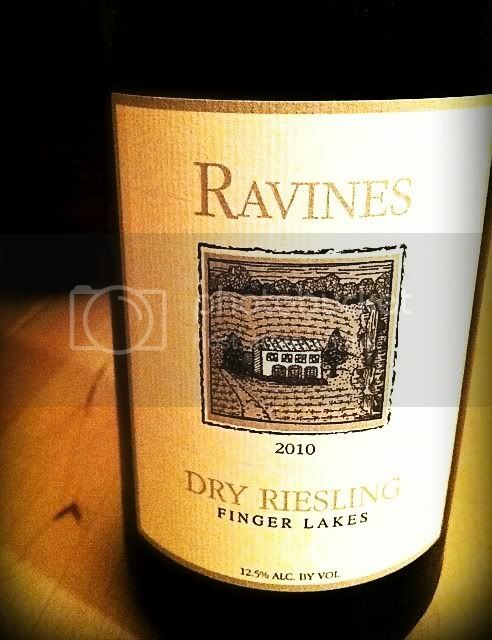 The Ravines Riesling pours up pale golden in the glass. It's not a surprise by now, but minerals abound on the nose. Fruit does make a good play here, though, mainly lime and honeydew. On the nose, lime notes and a minerality even stronger than on the nose make an appearance. Citrus zest on the finish mates with a very good acidity. 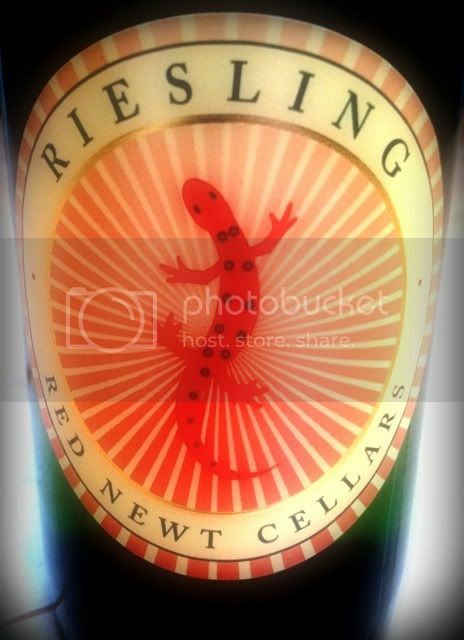 Red Newt’s “Circle” Riesling has the pointer on the label’s “sweetness scale” pointing to medium-sweet. Winemaker David Whiting uses grapes from the southeastern shore of Seneca Lake to produce a Riesling which carries an 11.5% abv number and has a residual sweetness of 3.4%, several points higher than the previous offerings we’ve tasted. The '09 vintage was a double gold medal winner, and the ‘10 vintage is the result of a warmer than usual growing season. The winery says you can expect extra notes of baked fruit. The pale wine has a beautiful nose of honeysuckle and oranges, with the minerality not as prominent as in the four tasted so far. Peaches and a light citrus spray decorate the palate, with the finish delivering a lengthy show of grapefruit. Not really a full-blown sweet wine, I’d call it off-dry. The acidity is nearly bracing, too, so it’s a food-friendly quaff. The Wagner family has four generations of winemaking behind them on the eastern slopes of Seneca Lake in Lodi, New York. I’m a big fan of wines from Lodi, California, so my hopes are high that more than the name will be similar. The sweetness meter on the back label has the pointer right in the middle. The grapes come from the Wagner’s estate vineyard. Three lots of fruit are independently vinified, then blended together. A little yellower than Red Newt, but still fairly pale, this Riesling smells of apricots in a big way. There’s a slight minerality on the nose, but fruit is the big thing. The palate shows a nice lemon/lime/orange display of citrus and a hint of tropical fruit on the finish. The acidity is right on the money. Find out more about the Finger Lakes wine region atFingerLakesWineCountry.com and FingerLakesWineAlliance.com.